Built into a couple of the great halls along the eastern wall of the castle is the much-praised Shipwreck Museum, where a 2,300-year-old Greek trading vessel is on display, together with its complete cargo. 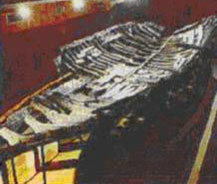 It is the oldest ship yet recovered from the seabed anywhere. The ship was discovered in 1965 by a Girne sponge diver some 2km off the coast from the castle. Over the course of 1968 and 1969 a team of 50 underwater archeologists from the University of Pennsylvania Museum raised the vessel systematically from the seabed and it then took a further six years to reconstruct. Its cargo consisted of some 400 wine amphorae from Rhodes, 29 stone grain-mills, lead weights and a staggering 9,000 almonds as food for the crew. It was these that enabled the carbon-dating of the ship. The reconstructed vessel is now in a separate temperature-controlled room. The Aleppo pine timbers had to be soaked in a preservative bath, then dried, and the hull was sheathed in lead. No skeletons were found, so the crew is thought to have swum to safety when the ship sank. The museum is well laid out and is enhanced by the setting inside the lovely Gothic halls which form the main surviving domestic rooms of the castle. The museum was opened after the division of the island in March 1976, though most of the work was in fact completed pre-1974.